Turns out, everyone loves big government. Dr. Chris Faricy shows that Republicans regularly enact tax breaks like 401k and 529 savings plans that use the government to redistribute wealth, and when these expenditures are counted as social welfare programs, the United States spends like many European countries that conservatives tend to decry as graveyards of freedom. The problem is, tax breaks are often inexact tools that don’t direct resources to where they are most needed. In this moment when conservatives at the federal and state levels are taking the long knives to the social safety net, Dr. Faircy’s work shows that the same forces often have no problem with big spending, so long as it happens quietly in the tax code, but that approach doesn’t do nearly as much to address poverty or reduce income inequality. Professor Christopher Faricy is an associate professor of political science and public policy at the Maxwell School of Citizenship and Public Affairs at Syracuse University and the author of Welfare for the Wealthy: Parties, Social Spending, and Inequality in the United States (Cambridge University Press 2015). Fairicy’s research areas include public policy, political economy, political institutions, and public opinion, and he is broadly interested in examining the politics of income inequality. 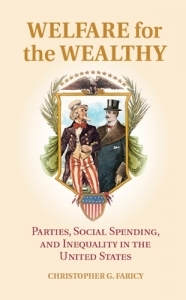 Welfare for the Wealthy examines how political party power influences both public spending and private subsidies and how, in turn, these changes affect inequality. Where: Junior League of Raleigh, 711 Hillsborough St.